Pick the right Windows 8 version you need! Many users that are currently using Windows 8 or an even older version of Windows 8 are still puzzled by this question – what will I get if I switch to the ultimate, Windows 8 Pro version? This is a good question indeed, and we’ll have rundown of the features that are present only on Windows 8 Pro, so you could know if it’s worth the money or not. Windows 8 is just about right for the vast majority of people and the Pro version is only aimed at, well, professionals, right? After all, paying $200 for Windows 8 Pro is no easy money, right? The price is much cheaper if you upgrade from Windows 8, of course. However, many are still angry over the fact that Media Center wasn’t included by default in Windows 8 and users have to add features to Windows 8 in order to obtain it. Let’s have a detailed look what you’ll be getting in the Windows 8 Pro version and isn’t featured in Windows 8. In the picture we’ve also included features of Windows 8 Entreprise, for those running a business. 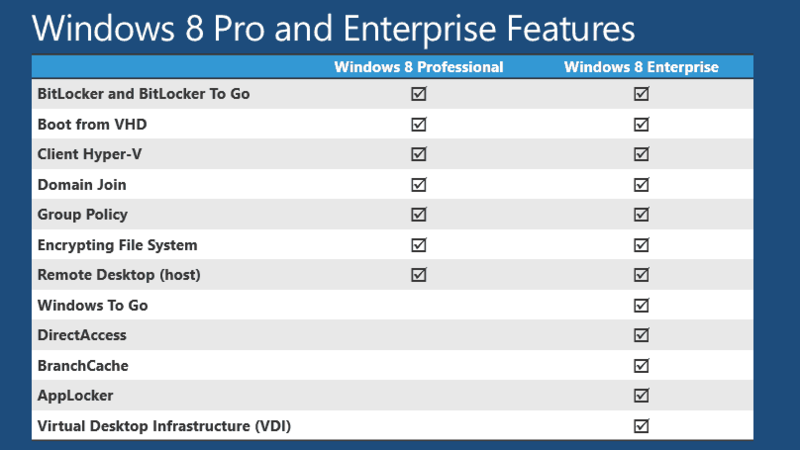 Windows 8 Pro features: what’s different from Windows 8? Unlike previous versions, with Windows 8, Microsoft has decided to limit the number of operating systems, releasing Windows RT, Windows 8 and Windows 8 Pro. Windows 8 Pro is somewhat similar to what Windows 7 Professional or Ultimate used to be. The Media Center option, albeit free, is also not included by default in Windows 8 Pro, therefore you will have to add it on your own, by typing “add features” in the Search Charm bar. And if you are running Windows XP, Windows Vista, or Windows 7, the great news is that you’ll have to pay only $40 to upgrade to Windows 8 Pro. This will definitely help increase the popularity of Windows 8 and the Pro edition, as well. As you can see, these are really features that only IT or business users will need and that’s why Windows 8 Pro is precisely for them. Many people think Windows 8 Pro has some goodies even for the average users, but they are being confused. Windows 8 is just as good for you as it is! Keep in mind that the most important features that you might need, are present in Windows 8 Home edition. Whenever you would like to do and fix, can be executed on this version. If you have the possibility to pay less on Home Edition – take it. It worth the money. So, if you are not one of the geeks that want to develop programs on your PC, do not bother about Windows 8 Pro. Editor’s Note: This post was originally published in May 2013 and has been since revamped and updated for freshness, accuracy, and comprehensiveness.